The Desert. 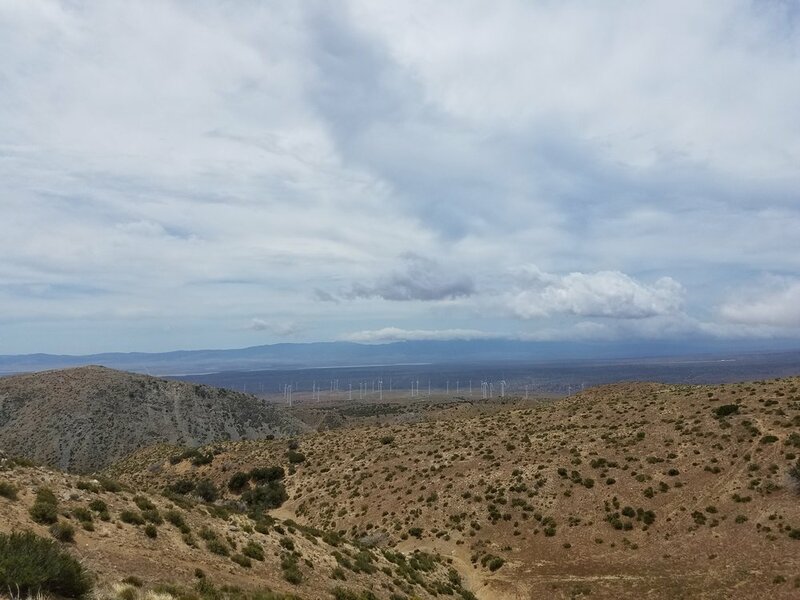 Tenth Stretch: Manzana Wind Farm to Highway 58. Day 31: Manzana Wind Farm to Tehachapi Cache. 16 miles. My eyes slowly opened to the dim blue light of dawn outside the violent confines of my loosely pitched tent. I could tell immediately that at least one tent stake had pulled out throughout the long night of punishing winds and sideways gusts of rain. Still lying down, I attempted to recruit the muscles needed to sit up, gritted my teeth through the whole body pain... and failed. Uh oh. I don't think my hair even made it off the pillow. With a feeble groan, I tried a little harder and finally got into a sitting position, a bit alarmed with how much effort it had taken. Those 41 miles from the previous day were reminding me what I'd done. I slowly stretched and packed up inside the tent until I could fathom actually standing up on my battered legs. I slowly stood up out of my partially collapsed, soaked tent, like an elderly man getting up out of a favorite recliner. Directly in front of me was a giant mass of black clouds. It was obviously raining under those clouds and every strong blast of wind brought a surge of that cold rain along with it. The steady soaking was barely noticeable through the pain. My left heel was so sensitive I couldn't put more than a couple pounds of pressure on it. Both arches of my feet were so tender, even tiny rocks under my shoes were making me wince in discomfort. Blisters were stinging on both heels. Behind my right knee was so tight, I couldn't fully extend my right leg. "You got any more stupid ideas today?" I asked myself out loud, shaking my head. 'NO!!!' my subconscious screamed at me. I decided to listen. I packed up the wet tent and slowly organized my pack until I was ready to start attempting to walk on my legs that were barely able to shuffle around camp. How far could I even walk today? 10 miles? Five? I started back up the loose hill I'd slid down the night before to get back on the dirt road. Every unexpected slide or dislodged rock jolted my body, sending a fresh wave of full-body pain through me. I gained the road, which was covered in what looked like a herd of coyote tracks. Limping heavily, I started back along the PCT. Entering the Manzana Wind Farm. Soon after, I broke into the beautiful landscape of wind turbines in the Manzana Wind Farm. The aqueduct had appeared again and I walked down the hard road, trying to warm up my battered muscles and tendons. Let's be real: I was waiting for the Ibuprofen overdose to kick in. Rain was on and off, but never really let loose. Mainly whatever raindrops were hitting me were being carried by the storm to the west in cold wind gusts. The sky looked much better over the Mojave desert. Water source at Cottonwood Creek. Within a couple miles, I came across the end of following the aqueduct at the Cottonwood Creek bridge. There was running water from a faucet and a fairly large water cache in a concrete bunker nearby. I wasn't able to do any cooking the previous night or that morning because of the collapsing tent and harsh weather, so I took advantage of the shelter and stopped for coffee and breakfast. Relatively wind-free breakfast up against a concrete bunker wall. Warm food and a short break to allow time for the pain meds to start working was exactly what I needed. My zombie shuffling turned into a light limp and I finally felt like I could move. 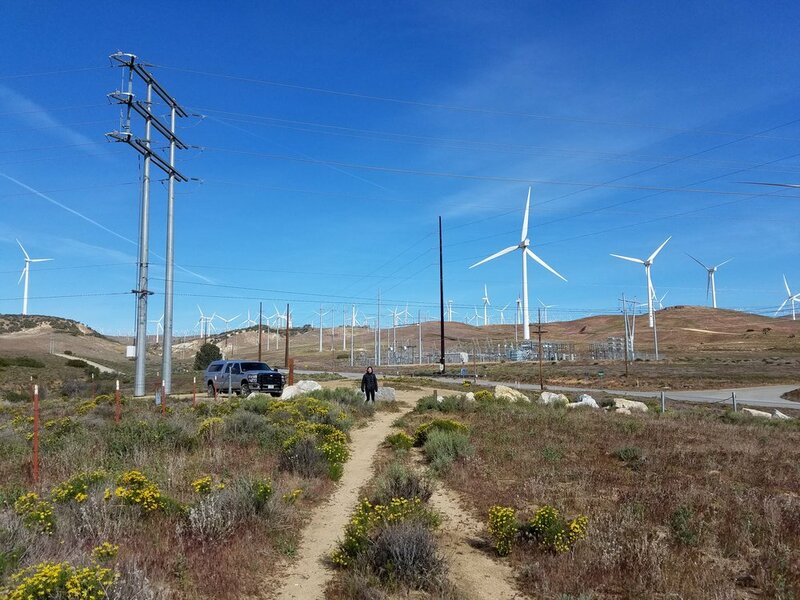 I was off of the concrete aqueduct and hiking back on dirt trail through the hundreds of wind turbines. I could feel the relief in my feet. I know these guys are controversial... but I think they're gorgeous. After the wind farm, the terrain started rising. I had a 4000 foot climb in front of me and I wasn't sure how far I was going to make it for the day. I slowly trudged uphill, stopping what felt like constantly. I had loaded up on water at Cottonwood Creek, which was the last reliable water for quite a while, so my pack felt heavy. 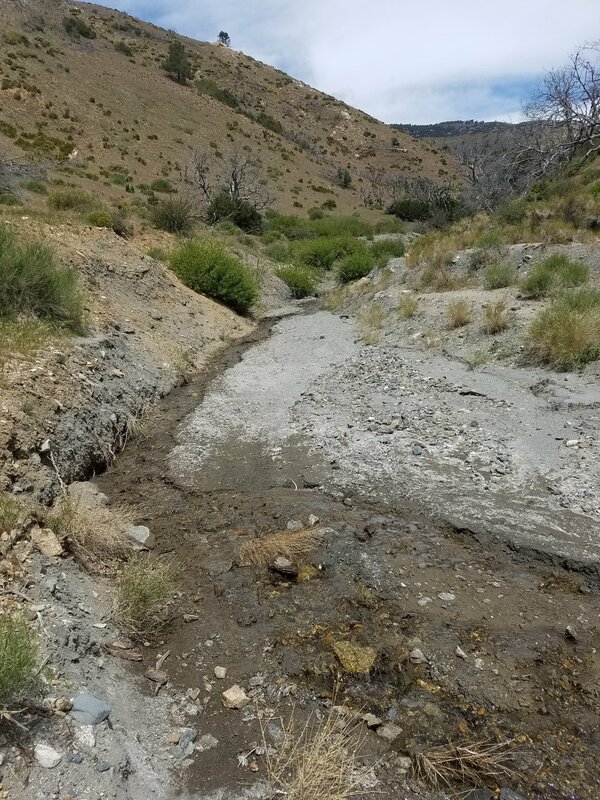 After dragging liters of extra water 2000 vertical feet, I came across the seasonal, usually-dry Tylerhorse Canyon Creek. Naturally, it was flowing strong. I said a quick swear and stepped over the beautiful creek water, continuing the sandy, uphill trudge, prompting more swears. The day was filled with soaring views of the vast Mojave desert and wind farms on all sides of the mountains. The visual feast distracted me from the symphony of various pains I was feeling with every step. I sat down at a particularly beautiful view and broke out the food. Big views of the desert and wind farms. My hiker hunger was raging, likely from the day before, but something else strange was happening. My sense of taste had dulled. No idea why, but everything seemed like it needed salt. This was leading to flavor combinations and food seasoning that was less about tasting right... and more about simply assaulting my sense of taste. I put together four ghetto fish tacos which by all logic were disgusting, but my dulled senses perceived the meal as amazing. Two packs of salmon, crushed Fritos, two packs of horseradish sauce, soy sauce, Parmesan cheese, and red pepper flakes all on tortillas. I could taste the intense saltiness and heat, but something finally wasn't bland! My hunger wasn't satisfied, so I sat there and ate three snacks and my dessert for that night. To simply stop myself from eating through every last crumb in my food bag, I forced myself to stand up and get walking. I made it less than a mile before I was sitting back down on a rock, feverishly eating the last of my snacks. After I was done fat-shaming myself, I continued along. The fear of another food experience like before Big Bear was enough to sink my appetite, albeit momentarily. I hadn't seen anyone in close to 50 miles when there was a hiker walking towards me on the trail! Her name was Joe. She was hiking south from Kennedy Meadows, then was going to flip back up to Kennedy Meadows after reaching the Mexican border and continue north through the Sierra. But more importantly, she gave me some incredible news: There was trail magic up ahead. My brain instantly melted and I could barely remember how to socially say goodbye to a fellow human. There was food ahead somewhere. Like, extra food I didn't have to feel guilty for eating! I floated down the trail along a windy ridge and there it was! Cookies, juice, chips, fruit, ramen, water.... and chairs! I had no idea we were anywhere near an accessible road, so this trail magic is still hands down the most amazing magic I've experienced on the trail. There were several campsites close by and the winds were worsening. I decided to stay there for the night in hopes that I'd be able to limit the exposure to wind for the night and get a good night's sleep to help recover my wrecked body. Winds came up heavily as the sun set. Once again, I settled in for a loud, uncomfortable, sleepless night. My distaste for wind was being solidly cemented in place. Day 32: Tehachapi Cache to Mojave. 10 miles. A beautiful sunrise to ease the sting of the high winds. The violent, cold, unpredictable gusts of wind ensured another sleepless night. The ridge I was sleeping near was creating multi-directional gusts that worked maniacally to collapse the tent all night long. Sandy ground wasn't able to hold the tent stakes as firmly as I needed, so after fighting to stay standing for hours, eventually one giant gust tore over the ridge, ripping up several stakes. forcing me to collapse the center pole and roll up in the loose fabric for the night. Typically, rolling up in the waterproof tent fabric leads to bad condensation problems in the morning from having your body heat and moisture trapped right next to you while you sleep. When I woke up, I slowly peeled the tent fabric away from my sleeping bag, expecting to find everything drenched... but there was nothing. The winds were blowing so hard and so unpredictably all night that any moist air was still being removed from inside the tent! Gratefully, I rolled up my stuff and got on the trail. Winds were insane. I crossed over the ridge onto the windward side of the mountain. The unpredictable gusts were exchanged for an intense, constant wind stream around 60 mph. After chasing my hat a few times, I had to stop and attach my hat to my pack with a string so I could make more mileage along the actual trail, and less mileage scrambling uphill, screaming at my hat in the desert like a crazy person. Blisters and my bad heel pain reminded me how much I needed rest. Pain was still slowing me down, but my motivation to put the next 10 miles behind me to get to Melanie pushed me forward. I was making good progress down the gradual downhill slope towards Tehachapi/Willow Springs Road, fighting through the cold winds and blowing dust, but there was an issue. I had to poop since like, yesterday. High, cold winds had me fighting the urge as hard as I could for the last 24 hours, but I was approaching emergency status. Not only had I waited, but now I was in the highest winds and coldest temps I had been in so far in the Mojave. I was SO close to being able to use a normal bathroom with little to no raging winds or bitter cold... but five more miles weren't going to happen without an accident, and I didn't want to test the strength of my relationship by showing up with... extra underwear cargo. Cursing my poor decision to put this off, I pulled over and found the one shrub in the landscape. I was completely visible from the trail, but I knew no one else was stupid enough to be out there. My mind couldn't care less about someone watching at that point. It had a priority. The winds ensured the experience was as uncomfortable as I had built it up to be. I dug my hole through the thorny grasses, exposed as much skin to the brutal winds as I could, assumed the position, got to work, then watched in horror as my fairly heavy bag of baby wipes and hand sanitizer was picked up by a huge gust and thrown 20 feet down the hillside. Reevaluating major life decisions, I duck-walked slowly down the open field after my fleeing baby wipes with my pants around my ankles. Cold gusts of wind threatened to knock me over and made me grit my teeth in freezing discomfort. 'How the hell did I get here?' was the main thought coursing through my mind as I speed-waddled through sticker bushes after my toiletries. By the time I had caught all my belongings, picked the stickers out of my underwear (paying special attention to the groin area), scrambled back up to my pack, and continued along the trail, it had been almost 45 minutes. The winds had stripped as much body heat from me as they possibly could. I hit the trail hard, trying to warm up and get out of the windy hell I felt forever trapped in. How was I not done with these 10 miles yet?? I pushed and limped and swore my way down the trail. To make the last few miles even longer, I could see the truck waiting for me next to the road from really far away. Endless switchbacks and hidden trail detours made me feel like I was just pacing back and forth on the hillside, making no actual progress toward the truck and my favorite person. I passed hastily through a gate lined with barbed wire, coming to an abrupt halt to the sound of ripping fabric. My custom backpack from Zpacks had just snagged on a barb, tearing a big gash in the side. I just rolled my eyes, vowed revenge on all barbed wire manufacturers, and continued the last several hundred yards to where the parking area was. I came up from a small picnic area and our truck came into view with my amazing lady standing out in the crazy winds waiting for me. Melanie standing out in the cold winds waiting for her impressively clean-underweared husband! "Oh my effing FINALLY" I said out loud through gritted teeth. Miles are much longer when there's a bed and warm food at the end. Melanie had a huge box of gummies, juice, and fresh fruit for hikers that she was excited to leave for some trail magic. We beelined for some incredible breakfast food at Henry's in Techachapi, then went to the post office to grab a resupply box I'd sent there from Big Bear. The box had a huge hole chewed in the side of it from some kind of large rodent along with several bags of food inside... so that was good. Let's hope that particular rodent had outstanding dental hygiene, eh? Now that I was in town, the mental suppression of the pain I was in vanished and my movement started reflecting the beating I'd subjected my body to over the last 500 miles. Melanie patiently waited for her elderly 31-year-old husband to shuffle behind her into restaurants and motels, holding doors for me and patiently letting me regale her with interminable anecdotes. Day 33: Mojave to Highway 58. 7 miles. In the Motel 6 room in Mojave, I sat up slowly in the dark room. It was 5 a.m. and I'd slept much worse than I was hoping I'd sleep. Melanie was still sound asleep. I'd always been jealous of her ability to sleep deeply, pretty much no matter what. My anxieties had kept me in and out of sleep. The weather reports kept escalating. Winds for the day were supposed to peak around 100 mph along the ridges where I was headed. To add to it, I had felt the underside of my left foot throbbing all night long. I attempted to stand on the hardwood floor of the motel room... and couldn't. The pain in my heels was the worst it had been so far. I sat in the darkness, staring down at the floor, running the same thoughts through my head over and over again. My racing thoughts continued until light appeared. I stood up on the balls of my feet and painfully scooted toward my shoes. The hardwood floors were unbelievably painful to stand on without them. A quick Google search and it was pretty cut and dry: I had Plantar Fasciitis. Really bad in my left foot, mildly in my right foot. Cures included rest and rehab, also known as quitting the trail. I stubbornly threw my pack together, now even heavier with my seven days of food to get me to Kennedy Meadows, putting more pressure on my feet. Melanie very sweetly carried my bag to the truck and waited for me to slowly follow her everywhere. I was mostly quiet, battling with my own thoughts. She made sure I knew she was going to support whatever decision I made through this trek, but I think she's always known exactly how stubborn her husband is. We went to a nice breakfast, then drove to where she'd picked me up the previous day. We stopped and I just stared out the window. The trees were violently thrashing in the winds. The truck swayed with every intense gust. Where was I going to camp in this? My tent wasn't going to stay up in winds this high... Highway 58 was seven miles away. Was there an overpass I could find shelter in? What if no shelter appeared? Would I just have to keep walking? Melanie could clearly see I wasn't excited to step out of the truck. She was supposed to head home after dropping me off, but instead offered to stick around for a few hours. She suggested I leave a few of my heaviest items with her, hike the seven miles from Tehachapi/Willow Springs Road to Highway 58, and she'd be waiting there with my stuff where we could make a decision whether I'd stay outside for the night, or get another motel room to wait out the weather. Her clear, logical suggestions helped put my mind back on a positive course. I agreed, unloaded my backpack a bit, then set off into the winds. Walking out into 95 mph winds... At least the wind turbines were happy! I was on a mission. Seven miles? I could do seven miles in any conditions, right? Let's get this over with. I stormed along the trail, pausing only briefly for pictures of the beautiful fields of wind turbines, happily spinning in the insane winds. Small groups of cows were running through the whipping grass, like the winds were exciting the big animals. It seemed odd. I'd never seen cows run so much or so fast. 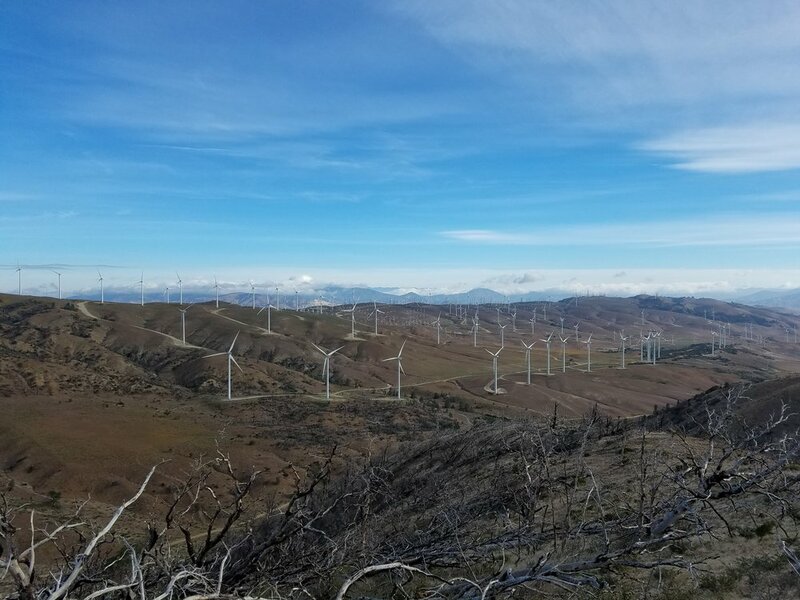 Several miles out from the truck, the trail summited a blunt ridge and I found myself on the windward side of the tallest hillside in the area, topped with many, many turbines. "That's not a good sign..." I inaudibly muttered into the wind. The winds had definitely stepped up a notch. I was walking where winds would be the worst. I felt like I was in a river. The constant, unrelenting stream of 90+ mph wind was roaring up the hillside. I was having a hard time standing on my feet, so I started walking on the side of the trail, leaning into the wind at an angle, finding that balance point where I could comfortably walk sideways without being knocked over. It was going well, seemingly defying gravity as I walked along the steep hillside. 'Well this isn't too bad,' I thought to myself. The constant stream of wind died just long enough for me step back down to the flat trail, putting me off balance for a massive blast of wind that surged up the hillside. I felt my backpack thrown to the right, spinning me 90 degrees so I was facing downhill. Before I could react, I hit the hillside on my backpack and starting backward somersaulting up the hillside! After the first full somersault I managed to roll to my side and sunk both hands into the loose grass and dirt, gripping as hard as I possibly could to stop my momentum and lie still while the gigantic surge of wind screamed over me. Looking downhill toward the 58 where Mel was waiting. I had another few miles of downhill hiking to get to her and I moved as fast as I possibly could. I wanted out of the wind as soon as possible. I reached a road where I had to walk along pavement for the last mile. I gritted my teeth through the pain in my feet from the hard surface. Soon though, I saw the truck with Melanie, once again, waiting outside the truck in the disgusting weather for me. I hopped inside the truck where she'd actually be able to hear me. My sanctuary from the wind! I exhaustedly looked at her, "We're staying another night in a motel." She just chuckled, "I know."